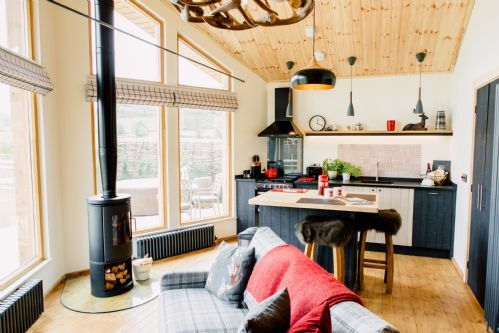 Hyggelig (hoo-gah-lig) is our traditional Nordic style log cabin. 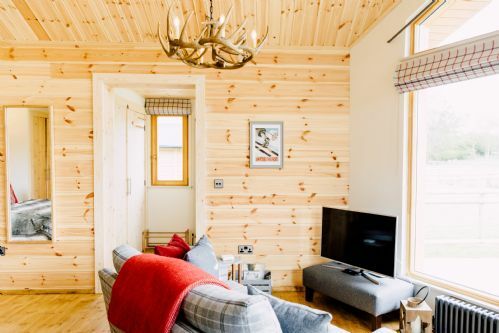 Internal wood cladding making Hyggelig feel cosy and inviting. A wood burning fire, faux fur throws, soft fabrics with a modern open feel. With a stylish soft feel hot tub to relax and unwind in, you feel miles away from the stress of everyday life. 'Hyggelig' can be defined as togetherness, relaxation, indulgence, presence and comfort. 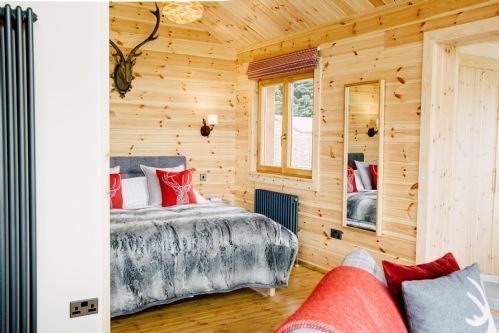 All things we trust you'll feel in this luxury log cabin. Absolutely wonderful place to stay. Everything inside and outside the cabin furnished to a really high spec which made the stay much more comfortable. There is a secure bike shed which we used and somewhere to wash the bikes down when you get back. Nice games room too which kept us entertained for a couple of hours! Very well equipped, the cabin was amazing. Such a fantastic build and finish, the heating is very effective, we was able to cook a roast in the kitchen. Everything you need, great water pressure in the shower. Comfy seats, sofa and bed. Nice views, toasty hot tub. The site was very clean. Staff are friendly. There was no downside to our visit other then we had to leave. Would be happy to visit again. This is our third visit to Rivercatcher and our first in one of the lodges. Every visit has been wonderful - the quality of the accommodation, the setting and the peace and quiet. 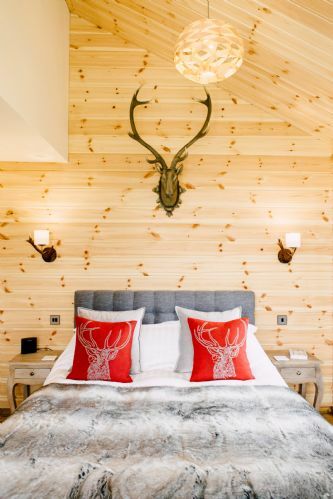 We have particularly enjoyed staying in the lodge - it was warm and cosy and very romantic. 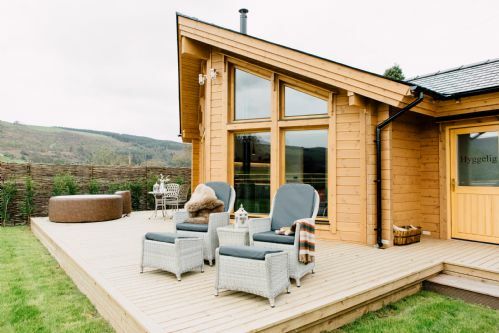 We started each morning watching the sunrise from our hot tub, then a day walking locally or reading in front of the wood burner before sunset and star gazing, again from the hot tub! Just perfect! Absolutely loved our stay, perfect surroundings and views, every little thing was thought about, very impressed, couldn’t have had a nicer place to stay, will definitely be back! A wonderfully comfortable stay in fabulous surroundings. The cabins have everything you could need for a relaxing stay. Uninterrupted views from the hot tub. 10 out of 10. A truely amazing place in a beautiful location - could not say enough great things about this holiday. It really exceeded all our expectations and the little touches like the welcome basket and the fresh local produce were gorgeous. The dog wash station complete with complementary towels for Paddy was a very nice touch too. We had everything we could have possibly needed for a marvelous stay in your log cabin. The second day of our stay, the hot tub could have been hotter. 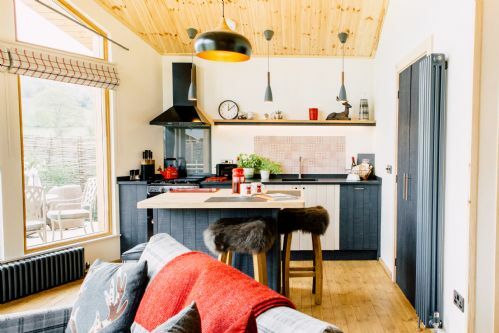 When we arrived at Rivercatcher we were immediately blown away by the stunning location and the fabulous accommodation. 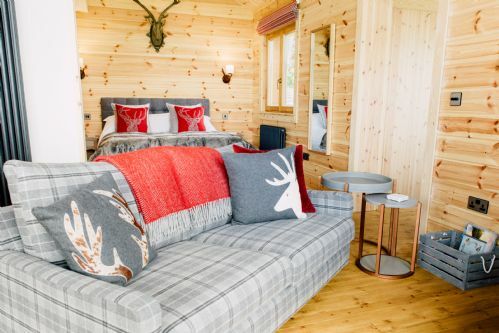 The quality of the log cabin, and the high quality internal and external furnishings were amazing, and the size was perfect for us - roomy yet cozy. Inside a we were greeted with a real log fire, comfortable sofa and bed, well equipped kitchen, and spacious shower. Outside a fantastic spa, table and chairs, and gas barbecue, with amble garden space. The welcome basket was a really nice touch, and the local milk, butter, bread and jam were delicious. There was a really helpful 'guide' giving Ideas of where to eat - we took full advantage of the advice that the local store sold home cooked Thai food (really tasty it was too). We had such an amazing, comfortable and relaxing weekend we didn't want to leave, and will definitely be back soon. We arrived about 5 pm with our 4 digit number emailed to us previously and were able to get in the lodge straight away. It was very spacious and clean. Our welcome pack of tea, coffee, local biscuits, bread, milk, jam were very nice indeed. The folder and guest book provided us with some good information, although we had done some investigation on the area and had an idea what we wanted to do. The local pub, The Dudley Arms was also just a 10 min walk away and the landlord and staff could not have been more friendly and helpful, food and drink were both excellent and even when busy nothing was too much trouble, also a visit to the nearby Bryntirion Inn serves a great meal. We ended every night under the stars in the hot tub which lead to us both sleeping like lambs. Aled ensured our hot tub was topped up each day and was also up for a friendly chat as he went about his duties. A wonderful place so spend some time either chilling, checking out North Wales or a bit of both. 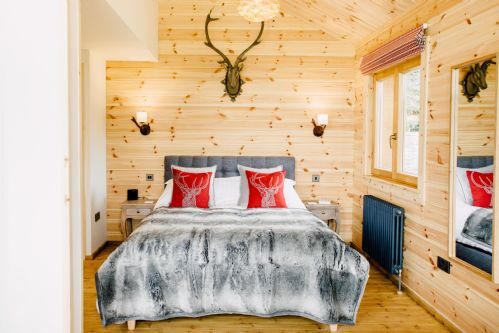 Possibly the best lodge in the UK! 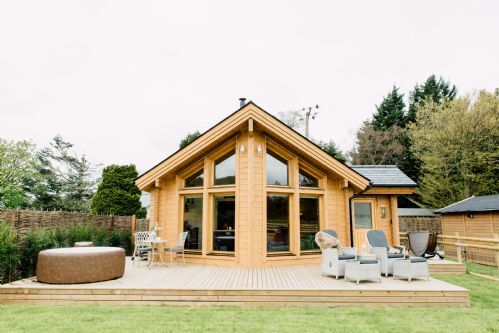 The Hyggelig log cabin has everything you could ever want! I was seriously disappointed I could not holiday oversees this summer and I booked Rivercatcher for my 8th anniversary. Me and my partner were taken back as soon as we pulled into the car park. Everything was so clean and well maintained and the cabin itself is 5 star. 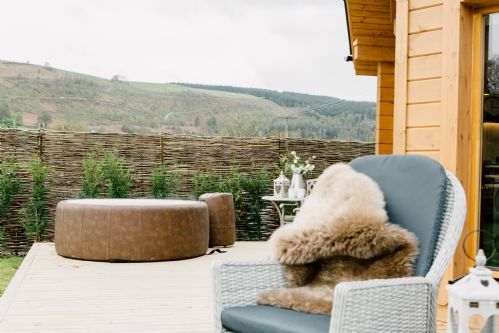 Waking up every morning to the view of the hills was amazing and then star gazing at night whilst relaxing in the hot tub was the cherry on the cake. The focus on privacy was very apparent and I will be re-visiting Rivercatcher in the near future. BOOK THIS CABIN! You will not be disappointed..
We were the first to stay at Hyggelig and it had everything we needed and more. If you are seeking a tranquil countryside retreat, this place can deliver that in bucket loads. 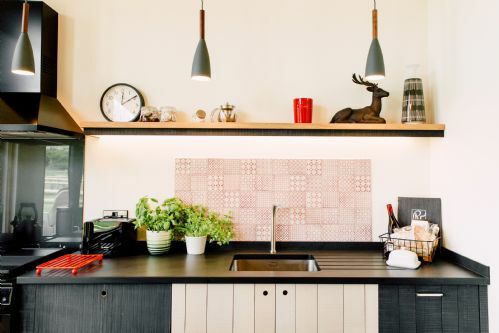 From the spring lambs, daffodils and scenery to the fit out of the cabin. The hot tub and bbq we’re exactly what we needed after climbing Snowdon! Had we have known it was only marginally more to book for 7 nights instead of 3 would would have definitely stayed for longer.